With less than a week until Thanksgiving, you know that can only mean one thing- we're officially in pumpkin pie season! I mean, is there really anything more Thanksgiving dessert appropriate then a slice of pumpkin pie?? I'm gonna go with "No!". Of course, the downside to enjoying a slice of pie is alllllll the work required to make one. Making pie dough, rolling pie dough out, opening cans, beating eggs, baking for-EVER, letting things set and cool. Like, who has time for that on the reg?! Answer: no one! Now, of course, I'm all for taking the time to make something extra special for the holidays. But at the same time, I also recognize that extra special doesn't have to mean extra time in the kitchen. 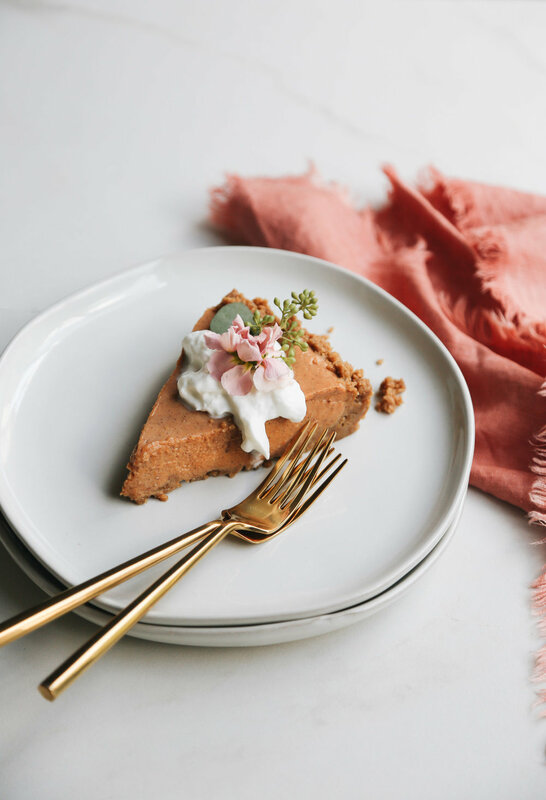 This no-bake pumpkin pie with a gingersnap cookie crust is the perfect example. It sounds fancy, it tastes like you spent hours making it, it's bursting with all the right flavors of fall, and yet it requires a mere few minutes, a few ingredients and no bake time. No, really. I'm sharing this easy pumpkin pie recipe over on Sugar & Cloth today. If you're still figuring out your Thanksgiving dessert menu, or you're trying to figure out what to bring to your family's dinner, look no further than this pie. It's so good you may never want traditional pumpkin pie ever again! I'd love to know, do you prefer pumpkin, apple or pecan pie? O, do you skip pie altogether?